OK, enough with the sentimentality already. In the previous post I looked at the excellent Thumb keyboard software for the Transformer. Now let’s look at the item that gives the product it’s name – the Transformer keyboard dock. I covered the connectivity of this device 3 posts ago, so now I’ll cover the keyboard in use. Here’s a shot of it connected to the tablet. Connected this looks just like a netbook – and that’s pretty much how it works. Having a keyboard for a tablet is not remarkable; Apple have two for the iPad. One is connected through the dock port, and one is a bluetooth affair. 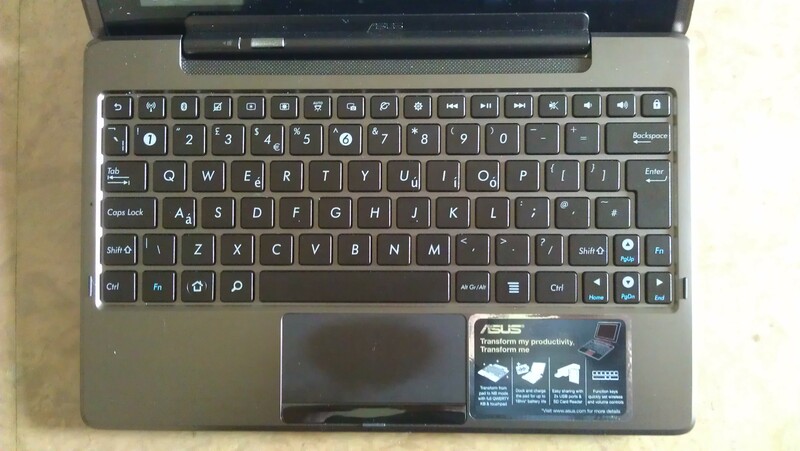 Both are nicely made, and have special function keys, just like the Asus. The difference here is that this combination can be used on your knees or lap, like a proper netbook or laptop. The keyboard is extremely solidly connected to the tablet, unlike the essentially gravity-based connection of the iPad to it’s dock (e.y.h.o.a). Moreover the screen angle can be altered to your liking, unlike the fixed angle of the iPad (e.y.h.o.a). 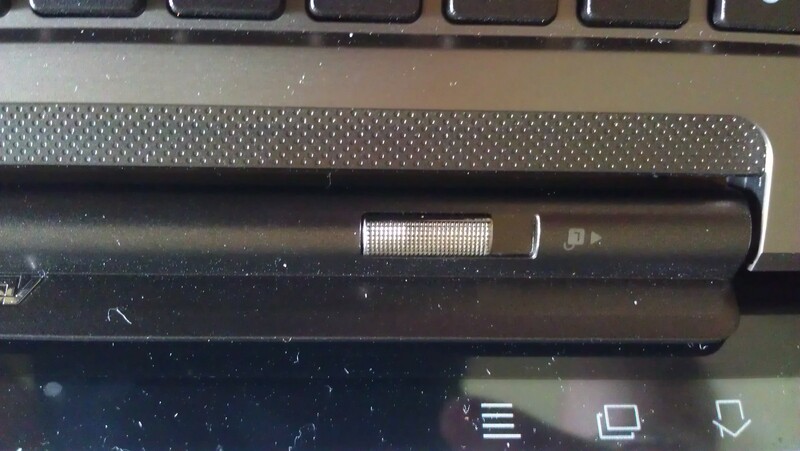 To connect the tablet, it is pushed firmly into the three connectors in the dock. And a sliding catch releases it, shown here on the left. Some have complained about a difficulty in inserting the tablet – I have to say it works perfectly for me, adding and removing the keyboard is quick, and solid. Other than the solidity of the fixings, the fundamental thing that distinguishes this keyboard from Apple’s is the trackpad. I can’t imagine how you can use a tablet without one, since to navigate you would have to touch the screen, and to type, use the keyboard. On the Transformer, the touchpad is so good, you never need to touch the screen (e.y.h.o.a), and movement around the homepage and apps is transformed (har har). In the next OTA Android update (due today or tomorrow), multitouch is enabled on the trackpad, allowing pinch-zoom and other neat tricks (e.y.h.o.a). Here’s a close-up of the keyboard itself. In addition to the normal alphanumeric keys, there are dedicated keys for exit, home page, and menu, although strangely, not one for the task manager list. Two ‘ctrl’ keys are provided and shortcuts like ‘ctrl c’ and ‘ctrl v’ work for cut and paste in some applications, like the Polaris (MS office compatible) suite provided as part of the offering. The backspace delete key is offered, but sadly not the forward ‘delete’ key from a PC. And there is a row of dedicated keys along the top for an array of system and multimedia functions. All very nice, so what’s it like in use? Well mechanically, the keyboard is lovely. It pretty much exactly the same size as my Netbook keyboard, and has a firm positive action, despite the chicklet style keys. I have to say though, that it is not all roses, and I think this is a limitation of all tablets at the moment. The keyboard bypasses the brilliant Thumb keyboard I showed you in the last post on this topic. So the typing suggestions, spelling corrections, dedicated keys, and single key phrase entry are all missing. Since all apps assume that spelling correction is there via the soft keyboard, they don’t provide it for the case when you are using a hard one. As a result, text entry is much improved, but accuracy goes downhill. And in addition, a glaring limitation in tablet design (true for IOS or Android) becomes more apparent when you are this tantalizingly close to a full PC experience. That limitation is the almost complete absence of text highlighting by mouse drag and left click. You may not think about it even, but that’s how you select almost everything on a PC – it’s how you cut and paste, choose files to copy, highlight stuff etc. And it’s just not there on a tablet. Instead, on an iPad, it involves a very frustrating exercise in trying to be precise with the end of your index finger, which is not a usable approach for extended editing. On Android sans keyboard, it’s the same – a little more usable in my view but still frustrating. With the keyboard it gets a bit better, as you actually can drag and select with the trackpad and left button. But not all apps know about keyboards or trackpads, so the method of cut and paste is different across many of them. What is needed here is a standard way for Android to select, cut and paste text that is more practical than requiring a finger shaped like a pencil. One clever Android app is offering some solutions to this that may show the way forward, and I’ll cover it in the next post or so. One other thing about the keyboards. Apple’s one weights around 510g. The Asus keyboard (which packs a great deal more in) weighs 640g. Together whether from Apple or Asus, the combination is over 1kg, and around the same weight as my 1.4 kg Samsung Netbook, removing a large part of the portability advantage of the tablet. Bummer! So what to take away from this? First thing is that a tablet plus keyboard is a long way off being a substitute even for a Netbook for serious editing. Second thing is – get over it! 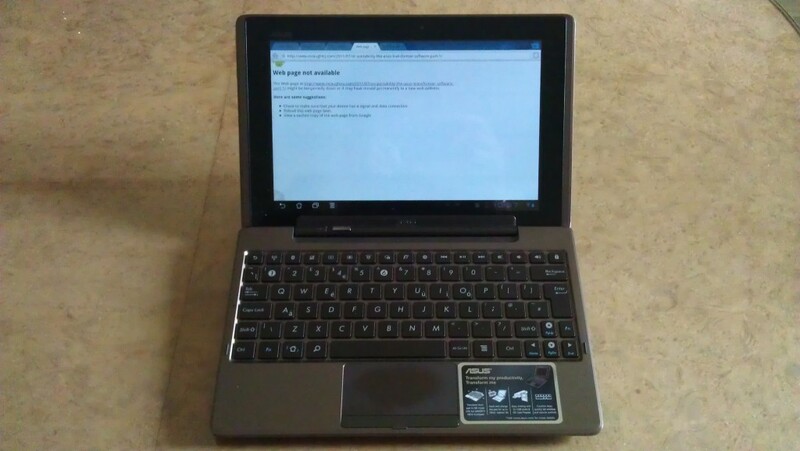 The Transformer tablet is fantastically better than a netbook for 75% of what I do with it – namely reading things and browsing. Whatever I do in serious creation work on the Transformer I always finish off on a laptop, where I correct it and send it on it’s way. The tablet is an adjunct to, not a replacement for a PC or laptop. But I tell you one thing – I now only use my Transformer and a superlight laptop. I have stopped using my big under-the desk PCs, and my quad core laptop. In fact I don’t use my study (where these things are housed) anymore. My complete IT kit fits in a couple of tiny cases and weighs around 2kg total. Very liberating. I’ll describe how all that works in future posts, along with some more of the great Android apps that I use on the Transformer.